I will start this by saying I've never read a Goosebumps book, but I'm guessing this would be a fun trip down memory lane for those who have. It was a cute movie, but very predictable (there was one twist I didn't see coming). It was one big cliche, including the dialogue, but I am not their target audience. The CGI was good and the movie was action packed. While I wasn't blow away by it and would have been just as happy to have seen it on DVD, my husband and 14 year old daughter loved it. They gave it 4 sheep. If you are looking for something entertaining for your young teens to do on a weekend or rainy day, this will fit the bill and worth a matinee price. Be sure to check out the cute cameo by R.L. Stine at the end of the movie. Thanks for the review - I won't be afraid to go see it now. My kids and their friends grew up on these tales, and we watched the TV series together too. 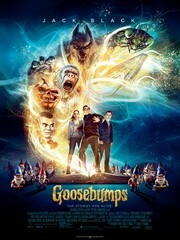 While I was glad to see Jack Black cast as RL Stine, I was worried about the story. Sounds like it would be just right for the age group that typically reads the books, and a nice trip down memory lane for me!